The online version of this article ( https://doi.org/10.1186/s13567-018-0614-y) contains supplementary material, which is available to authorized users. Trichinellosis, one of the important zoonotic parasitic diseases worldwide, principally results from eating raw or semi-cooked meat containing Trichinella larvae . Trichinella infection in humans is mainly caused by the species Trichinella spiralis, and domestic pork and pork products are the major infectious source [2, 3, 4]. China is one of the few countries with the highest number of trichinellosis patients, and there were 15 human trichinellosis outbreaks and four deaths were reported from 2004 to 2009 . Trichinellosis is a serious threat on human health, and it also has a great impact on meat production and food safety [6, 7]. Since trichinellosis is transmitted from domestic or wild animals to humans by ingestion of contaminated meat, it is necessary to develop a vaccine to interrupt the transmission from animals to humans, and a preventive anti-Trichinella vaccine would make a substantial contribution to the control and elimination of trichinellosis [8, 9, 10]. After the encapsulated muscle larvae (ML) are liberated from contaminated meat in the host’s stomach, the ML migrate to the intestine and are activated into intestinal infective larvae (IIL), which invade the intestinal columnar epithelium and develop into adult worms (AW) after four moltings. From the beginning of about 5 days post-infection (dpi), female adults give birth to newborn larvae (NBL) that penetrate into the intestinal mucosa and are carried to the whole body via blood circulation. The NBL invade and encapsulate in the host’s skeletal muscle to complete its life cycle . 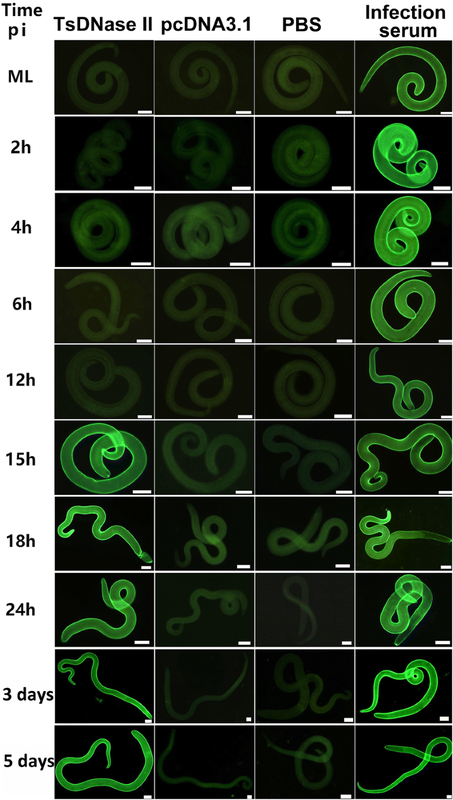 Therefore, the intestinal mucosa is the primary interaction place of the nematode with the host and the first natural barrier for combating Trichinella infection. The local intestinal mucosal immune response is important for immune protection against enteral Trichinella infection [12, 13, 14, 15]. The AW is an important stage during the T. spiralis lifecycle. Vaccination with AW crude antigens provides a highly significant protection with an 89% and 80% reduction of AW and ML; vaccinated mice exhibit an accelerated expulsion of intestinal AW, a reduction in female fecundity and decreased ML burden . In our previous studies, T. spiralis adult-specific DNase II-1 (TsDNase II, GenBank: AAY32316.1) were identified from IIL surface proteins and AW excretory/secretory (ES) proteins by immunoproteomics with early infection sera [17, 18, 19, 20]. The full-length TsDNase II cDNA sequence was 1221 bp and the predicted ORF (1–1044 bp) encoded 347 amino acids. The predicted MW of TsDNase II is 38.06 kDa with a pI of 8.85. The recombinant TsDNase II protein (rTsDNase II) was expressed in E. coli in our laboratory. The mice subcutaneously vaccinated with rTsDNase II elicited a significantly high level of serum anti-rTsDNase II IgG, and exhibited a 40.36% intestinal AW reduction and a 50.43% ML reduction after larval challenge . Oral inoculation with TsDNase II DNA vaccine also elicited an evident intestinal local mucosal sIgA response. The sIgA has a principal effect in mucosal defense and can interrupt worm invasion of the intestinal epithelium. 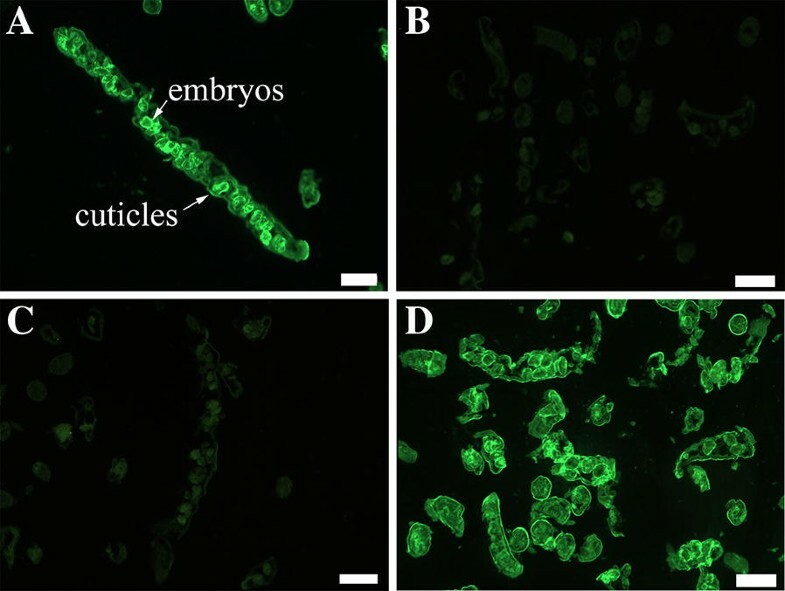 The sIgA against T. spiralis AW surface proteins mediated the worm expulsion of intestinal adults, passive transfer of IgA against Trichinella impeded establishment of Trichinella infective stage in intestinal mucosa of mice . Our results indicate that vaccinated mice produced TsDNase II-specific IgG and intestinal sIgA, which recognized the natural TsDNase II at the cuticle of T. spiralis AW and pre-adult stages. Intestinal worm expulsion might be due to the formation of anti-Trichinella antibody immune complex in the worm head, which can physically interrupt the nematode invasion of enteral mucosa [62, 63, 64]. Furthermore, intestinal local sIgA inhibit the fecundity of adult females, and interrupt the parasite settlement in the intramulticellular niche of the intestinal epithelium [14, 65]. 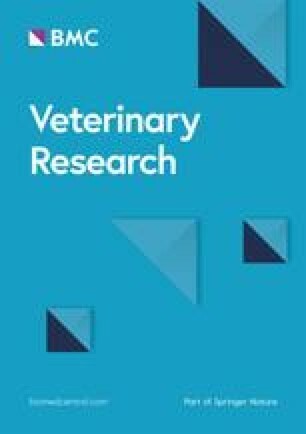 Our results show that the in vitro NBL production of females from TsDNase II-immunized mice was dramatically declined in comparison with pcDNA3.1 or PBS control mice, suggesting that TsDNase II-specific antibodies might inhibit intestinal worm development and reduce female fecundity [28, 66]. Additional file 1. Recognition of the native TsDNase II on the cuticle of T. spiralis various phase worms by IFT with intestinal sIgA of mice vaccinated with TsDNase II vaccine, pcDNA3.1 alone or PBS. Immunostaining was detected on the surface of 3 and 6 day adults and NBL probed with intestinal washings from TsDNase II-immunized mice, but not by intestinal washings from pcDNA3.1 or PBS control mice. The surface of the ML and IIL was not recognized by intestinal washings from TsDNase II-immunized mice. Scale bar: 50 μm.